The thing about Rotterdam is that it’s got a name that (presumably) sounds quite a bit nicer in the original Dutch. That is to say, it’s got a bit of an Iceland thing going on, at least to the English ear. To hear the name you’d never know it’s a gorgeous maritime mix of well-preserved ancient churches and cutting-edge architectural wonders — there isn’t a bit of rot, in the English sense, to be found anywhere. That said, if it’s going to rival Amsterdam for your travel dollars, it could do with a few more extraordinary boutique hotels. Which brings us to Mainport. Extraordinary it most certainly is, in both senses of the word: not just excellent, though it’s that, but unusual as well, as the best ones often are. 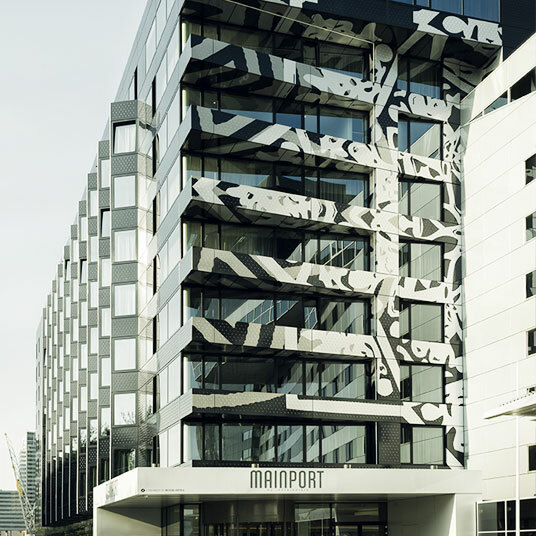 From here on the city’s newly redeveloped waterfront you’re treated to an impressive view of the Rotterdam skyline, but the views inside the hotel are scarcely less impressive — designer Feran Thomassen mixes minimal clean lines with eye-catching maximal patterns, and blends traditional Dutch craftsmanship with far-ranging international influences. The appeal, it should be said, extends beyond the merely visual. The eighth-floor “Spa Heaven” does its level best to live up to its lofty name, with a Turkish steam bath and a Finnish sauna in addition to its twin treatment rooms, and the guest rooms themselves feature whirlpool baths, oversized jacuzzis or private saunas. Add a cocktail bar on a panoramic terrace and a stylish and inventive restaurant — in this case a delightfully novel Australian eatery — and you’ve got the kind of luxury boutique that’ll earn a city a second look.